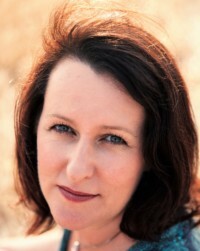 I am a doula, bodyworker and healer. Everywhere else in the world (apart from the Western world), after giving birth women get a month of rest, during which they receive special nourishing foods and treatments. Here in the UK, when you’ve just had a baby, our culture has got it all wrong, because you get virtually no support and all you get are presents for the baby. Yet what your baby needs is you to feel strong enough to look after him or her. So investing in a nourishing treatment isn’t a selfish act-it is an investment in yourself and your baby, and your family. You are not meant to be doing this on your own. Closing the bones is a ritual that celebrates YOU, the new mother, and what you have accomplished growing and birthing this baby. It can give you a chance to re-centre, make time for you and find yourself again. The ceremony goes like this: I setup a comfy mat on the floor somewhere warm and cosy in your house (or a massage table if you prefer to experience the massage table version of the massage). I lay out some rebozo scarves on it. You lie down on the mat on your back, supported by cushions under your head and knees. I start rocking your hips with a rebozo, I may rock other parts of your body too. Then I massage your abdomen, hips, chest, shoulders and arms with a special warming oil, rock your hips some more, and finally wrap your head, shoulders, rib, hips, knees and feet with several scarves and cover you with a blanket. 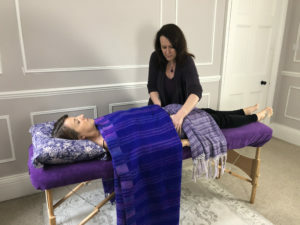 Whilst you rest I incorporate other ritualistic and healing elements to the process, such as reading a poem, singing and drumming, maybe also give you some Reiki, and leave you to rest for a while. I can come to your house with all the equipment necessary (this is tailored to your needs-we will chat about it beforehand, I offer the version of this massage on a mat on the floor or on a massage table), and the whole ceremony lasts between about 2h from start to finish, including a chance to chat to get to know each other first, and to talk about how it felt afterwards. I have been doing closing bones and teaching closing the bones workshops for since 2014. 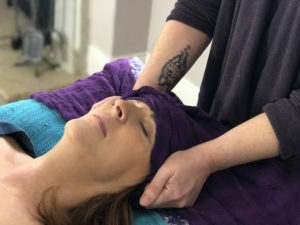 I have been humbled to be entrusted with passing on this wonderful ritual to women, and I am often always blown away by how meaningful and transformative this ritual is for new (and not so new) mothers. I feel that all women should have the chance to experience it.